A Walk in Arctic Woodland ! No, this is not a photo from Pickerings Pasture. It was, unbelievably, taken on a walk through woodland in Tromso, Northern Norway. Inside the Arctic Circle!! I couldn’t believe it! I don’t intend to make a collection of such photos but this sight really did shock me. I’ve seen the same thing in several South & Central American countries, as well as in Europe. Many of these countries have the problem of stray dogs too. And we won’t go into parts of Asia…. But why do people pick up and hang it in trees? I just don’t understand the logic. It doesn’t look good and it can be an environmental disaster. Plastic does not break down in the environment, although the contents will eventually. The council suggests that if you cannot find a dog bin, then double wrap the dog bag and place it in a normal litter bin. I’m not saying that people should leave it be but if they are good enough to pick up: why not dispose sensibly? And if you are caught short without a bag please use twigs to transfer the droppings to a place where it will cause little or no harm to other walkers – but NOT onto the grass were children play! * A council can also issue dog control orders against individual dog owners for offences including allowing a dog to foul a public space. * Councils can issue fixed penalty orders in relation to dog control orders. Where there is no local rate, the fixed penalty is £75. * In very serious cases (and this can include being caught leaving the bag in trees etc. ), magistrates can issue a maximum penalty of £1,000. At the same time I would like to say thank you to those of you who do “pick up” and I know most of our dog-walkers are really conscientious and are given a bad name by the few (is idiots too strong a word?) Although dog-less at the moment, as a dog-owner for many years I know it’s not the most pleasant task in the world, but it is important to us all that we keep Pickerings Pasture clean. We do not want the council to ban dogs in this nature reserve. One of our Dog-bins. Please use them. One place that really made me giggle was the Galapagos Islands, where I found a new meaning to the poo problem! 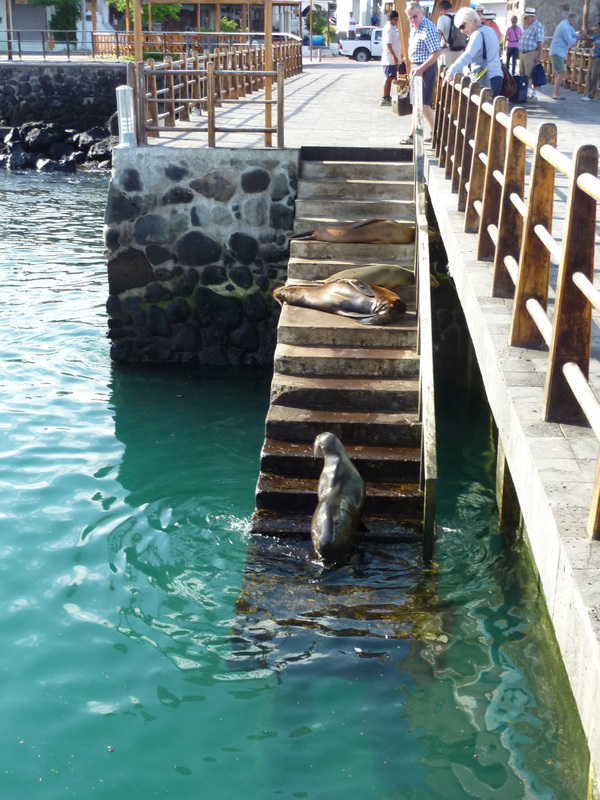 It came from the Galapagos sea lions, which roam the streets of the main town - Puerto Baquerizo Moreno! You certainly had to look where you walked there…. But seriously - please pick up and dispose of waste correctly. And let's hope others will follow the example ---eventually. 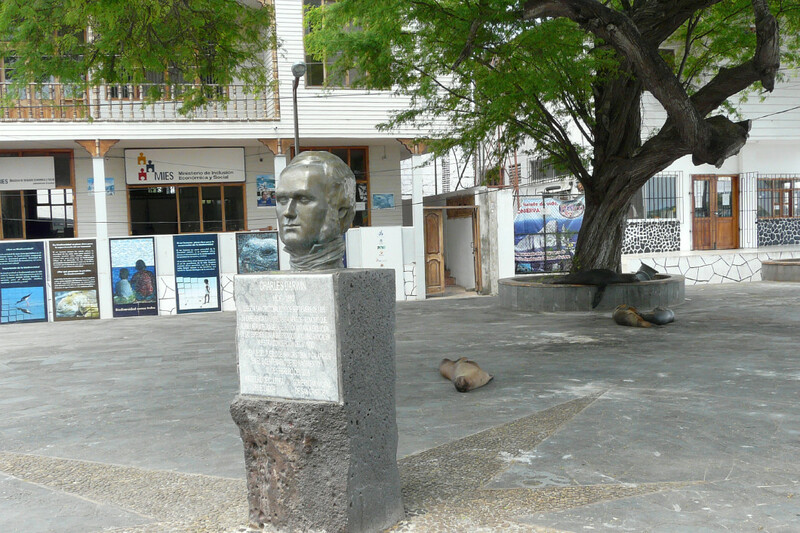 Town Centre - Puerto Baquerizo Moreno.